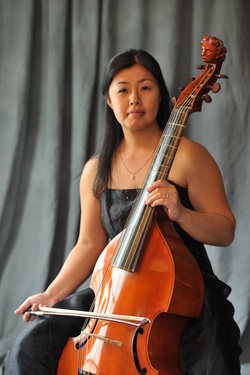 Cellist Miri Terashima started piano lessons at age 5. She graduated from the Ueno Gakuen University Music Department, where she specialized in Viola da Gamba performance and upright bass. She minored in harpsichord and pipe organ. Ms. Terashima has devoted herself to many public concerts -- both domestic and abroad -- including at Suntory Hall, Ueno-Bunka-Kaikan, Opera city Oumi-gakudou, various community halls, and educational concert series. She is an alumni and was a lecturer at the Ueno Gakuen University Music Department. Ms. Terashima started taking cello lessons from Yuri Sher (former BSO cellist). She plays cello for Baltimore Canon and plays piano for the Sher Piano Trio, which is a professional group including a BSO member. She also plays piano at Northwest Hospital as a volunteer, and teaches piano at home.